This is the most important business model in the world. It’s going to impact every single category, every sector, every marketplace. Even yours. About a year ago I started doing some strategic brand and marketing work with London-based Everpress, an online marketplace for on-demand soft goods printing. Everpress enables independent designers and small businesses to operate with no financial risk at an economy of scale to print things like t-shirts. They’re optimising throughout their platform and supply chain so they can eliminate product wastage and provide a legitimate alternative to the high-cost, unethical practices of high street retailers. The money goes where it should: makers and creators. And the environmental impact of clothing production is significantly reduced. This was the first time I started using what I’ve come to refer to as the “Full Stack Social Enterprise”. While I’ve seen something similar referred to as ‘sustainable consumer technology’ — I believe the concept is bigger than that. As of writing this, Google tells me this is a new phrase, so I want to put it out there. I want to give this business model a name because naming something gives it legs: people can share and talk about it. It stops being an idea and starts being a ‘thing’ people see out in the world. And I want people to talk about it, because I believe it’s going to change the way we all do business. What is a Full Stack Social Enterprise? I’ve borrowed “Full Stack” from the world of engineering, which typically refers to a ‘full stack engineer’ as someone who is able to work both on the back-end and front-end of a tech platform. Some have referred to companies like Uber, Airbnb, Spotify and other platforms as ‘full stack’ because in controlling the lion’s share of the ‘supply chain’, distribution, and data around it, they are attempting to optimise users’ experiences at the same time as minimising costs. While these companies have been both groundbreaking and successful in their impact on both culture and the global economy, they face numerous ethical issues — from the recent Lyft IPO that had no direct financial benefit to the drivers who were fundamental to the success of the company, to questions around how Airbnb impacts local rental markets, and beyond. They are optimising and minimising costs almost to the exclusive benefit of shareholders (a status the vast majority of their ‘suppliers’ are excluded from). In a world of a ‘gig’, ‘shared’ (or dare I say…‘servant’) economy, this is obviously hugely problematic. The second term I’ve borrowed is “Social Enterprise”. It refers to businesses that measure “doing social good” (I’ve left this intentionally broad) as fundamental to their metrics of success. For many, like Tom’s Shoes, this means putting proverbial shoes on the feet of people in the developing world. For others, like Patagonia, it means funneling profits into environmental protection. Truly social enterprises do not use some vacant ‘purpose’ language in their marketing to ‘offset’ their commercial activities, but they are actively involved and prize the importance of how much they can positively impact the world — always at the cost of financial profits to the business. Their businesses are based on doing good. Last week at FoodBytes in San Francisco, TOAST Ale’s winning pitch to the audience was “it sounds strange to say this to a room full of potential investors, but we put all of our profits back into food sustainability charities”. That is exactly the point of social enterprises. But typically, social enterprises lack the control, “full stack-ness” and data that would allow them to truly optimise to move beyond charity. Alone, these two business models have proved important for different reasons, but neither is that interesting in terms of truly disrupting any sort of status quo. Full Stack platforms optimise for the people at the top, and Social Enterprises still mainly function to give charitably rather than to enable those people who need (perhaps deserve) it most. Every. Single. Category. Is. Going. To. Be. Disrupted. By. A. Full. Stack. Social. Enterprise. Yes, even yours. Baby food, coffee, olive oil, every type of food and food marketplace, every type of clothing, every sporting category, automotive, homegoods, water, building contractors, music. Full Stack Social Enterprises can be single brands (Hiut Denim, Everytable) or marketplaces (Trade Coffee Co. or Everpress), they can be networks of independent (restaurants, musicians, caterers, dog walkers, designers, writers, building contractors) providers, or B2B (Bushel). Those companies that are already in the solely “full stack” category are in a race for profitability but will soon realise that unless they are optimising almost exclusively to the benefit of those people within their network who need it most, they will eventually lose out to those companies that do. It’s a bet I’m willing to place, and a hill I’m willing to die on. This is the future of business. Every business. At every scale. 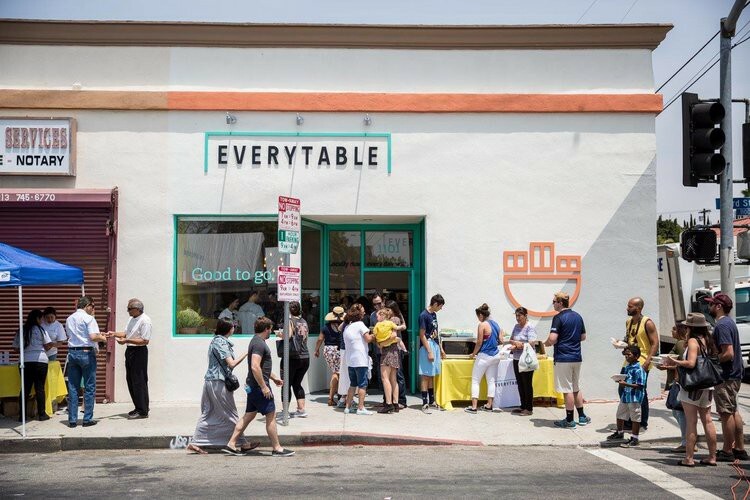 Businesses (often D2C) like Everlane, LemLem, Warby Parker, Honest Co., etc, have paved the way for the Full Stack Social Enterprise, but they don’t do enough. Some still don’t control their supply chain enough. Some are still just more or less “giving back” charitably. Great in principle, but they need to step up. The people who benefit most from a Full Stack Social Enterprise are the people within the supply chain themselves. The Full Stack Social Enterprise is a social leveler but there is also a lot of money to be made. Instead of funneling profits into charitable giving, they will put people to work and pay them properly. Instead of funneling savings into investor value, savings will be funneled into lowering wastage and environmental impact, profits will be shared by everyone involved. While some may say I’m a bit naive in my certainty of this prediction, I feel vindicated that some incredibly successful VCs are picking up on this sort of business model and calling it the future. These Full Stack Social Enterprises are going to start showing up everywhere. They already have. And the more we talk about it, the faster it will happen.